Playing with Flour: Valentine "Kisses"
The cookie dough can be mixed up a few days in advance, stored in the fridge, and ready to be rolled into balls, dunked into sprinkles, and baked! In this recipe, cocoa provides the deep chocolate flavor; I used dutch-processed cocoa, which gives it that dark color. I made the dough a day ahead. When it comes time to bake, take it out of the fridge and let the dough come up to room temperature so it isn't too firm. I scooped about 1 tablespoon worth of dough per cookie. Roll it in your palm to form a ball. They look so festive dressed in their sprinkle finery. After baking (it only takes 9-10 minutes; avoid over-baking so the cookies are nice and soft, slightly fudgy inside), the cookies spread just slightly. Let them cool on the baking sheet for 2 minutes, then press a chocolate Kiss on top. It's always fun to play with sprinkles though you might find random sprinkles around your kitchen for a few days afterwards. If you have trouble deciding what kind of sprinkles to use for these cookies, it might be a good idea to mix it up and use a variety. To my mind, the more variety the better, the more sprinkles the better! 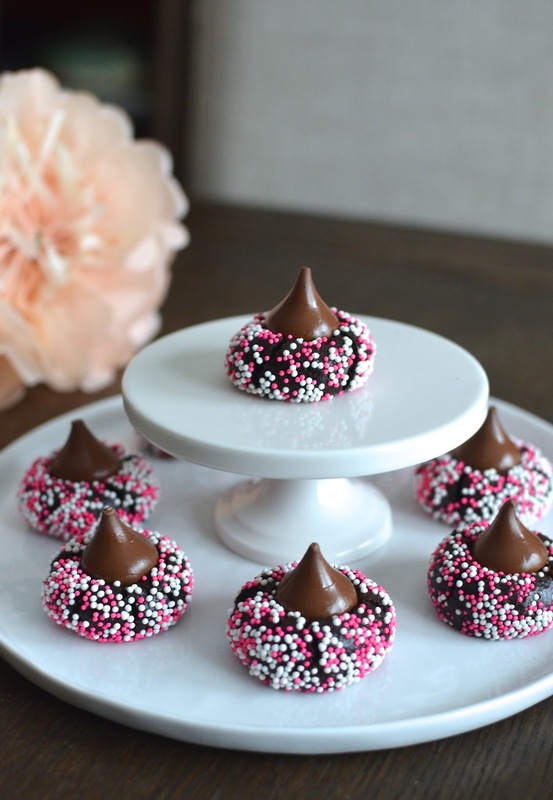 In addition to these cookies, I've made a few other treats in the spirit of Valentine's Day. For starters, I tried (yet another) macaron recipe. This one had a twist that involved mixing the meringue into the dry ingredients instead of the other way around. Sadly, it didn't work out very well. Most of them had cracked shells but luckily, they were still delicious! I also dipped some mini pretzel sticks in chocolate and again...more sprinkles! Plus, I whipped up some chocolate Rice Krispies treats. I usually use Martha Stewart's recipe but this time I tried the one from Dessert for Two. Needless to say, there were more sprinkles involved! 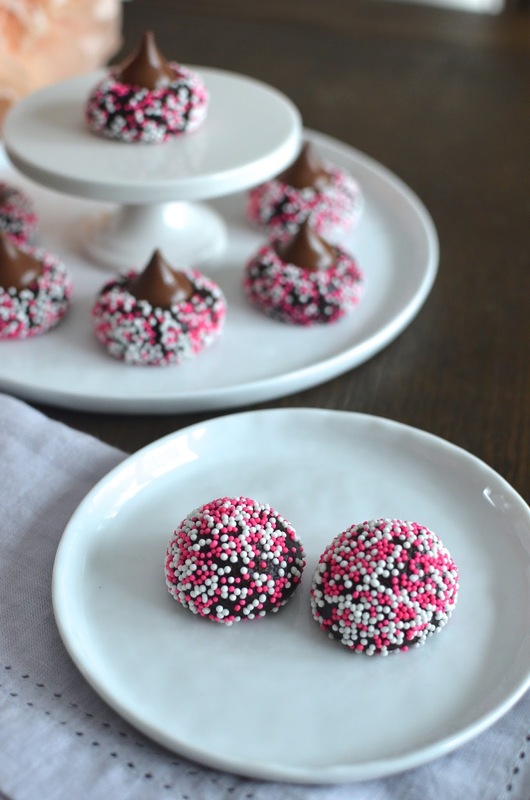 It's been fun making these chocolate treats for Valentine's Day. I packed a lot of it up to share with family and friends to spread a little love around. Hope your Valentine's day is sweet and happy - all the better if there's chocolate and sprinkles involved! Line 2 baking sheets with parchment paper or silicon baking mats. If baking immediately, preheat oven to 350 degrees, with racks positioned in the upper and lower thirds. 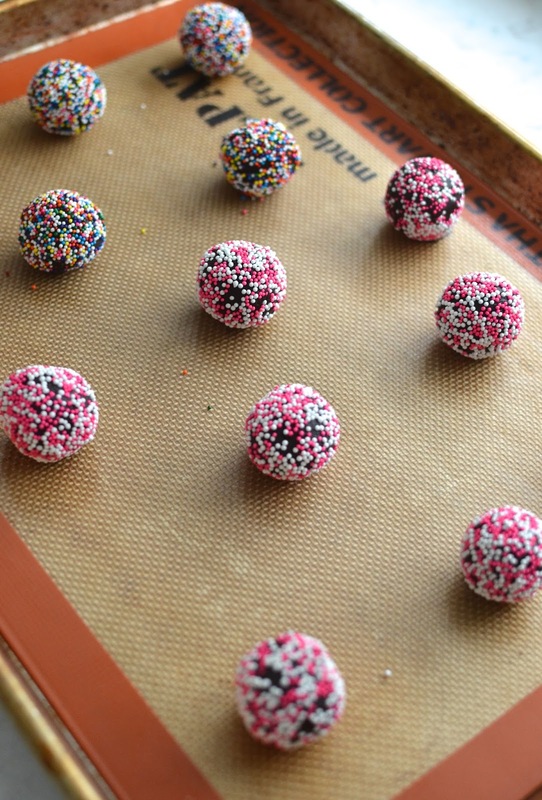 Place nonpareil sprinkles into a bowl. Shape about 1 tablespoon of dough into a ball using your hands and place onto the prepared baking sheet, spaced about 2 inches apart. Bake for 9-10 minutes, until cookies are set (avoid over-baking), rotating the baking sheets midway. 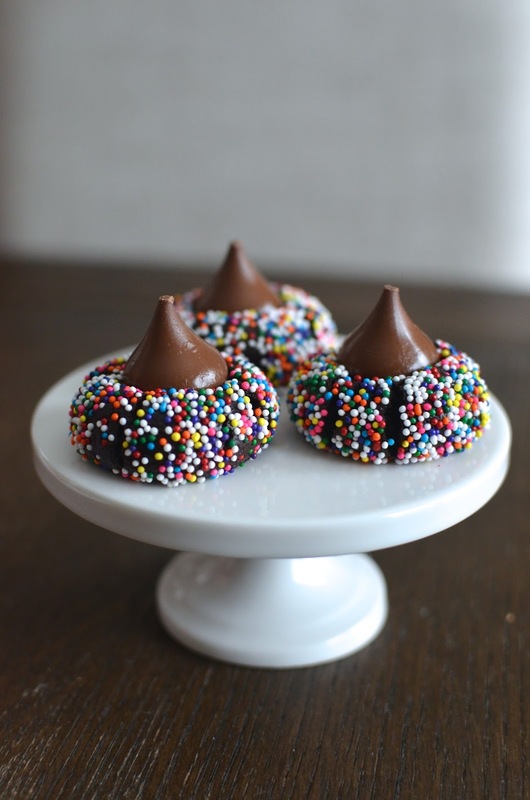 Remove baking sheets from the oven, let cool for 2 minutes, then press a Hershey's Kiss on top of each cookie. Transfer cookies to a wire rack to cool completely. Store cookies in an airtight container for up to 1 week. 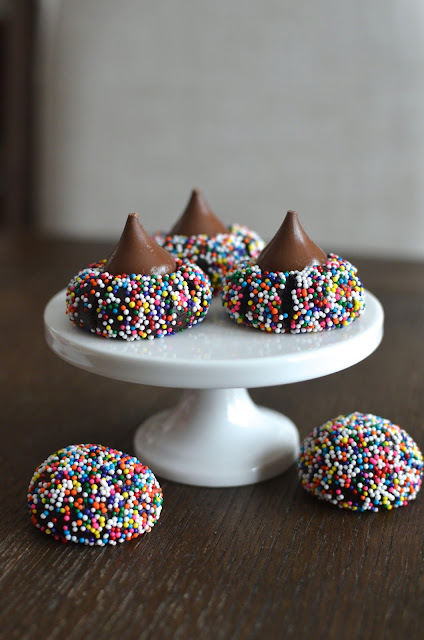 Your cookies are adorable and chocolate is always a great idea. Your macarons look perfect - and so pretty. 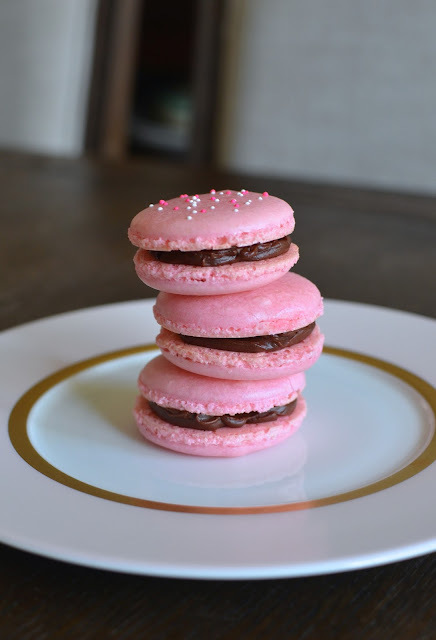 I love the Italian method and have a macaron recipe to share later this week. The feet are lovely! Have a wonderful week Monica. I can't wait to check out your macaron recipe, Tricia. I also think the Italian method is the way to go but I still like the French method for ease and this recipe I experimented with was on a smaller scale. It didn't work well but we managed to devour them anyhow. : ) Hope you have a lovely V-day! haha - I love that! I know you share my love of sprinkles and you take decorating treats to new heights. I do love these colorful festive expressions of love. : ) And so funny about the perks of having a dog! Chocolate euphoria! One bite and the world would be a much better place. These are so cute and fun to bring to school for the kids or to functions. I remember the days (way back when) when treats were allowed in school. Loved that! These are so pretty! I'm not sure I could stop at just one of these! What a beautiful sprinkles galore! I love all the things you made. Absolutely adorable.